Finally a quilt. 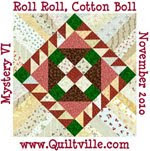 This is from Quiltmaker, March/April 07. It has been sitting on my sewing table that long waiting for me. I have finished the top and now need to add borders. All of these 2 1/2 inch squares came from an army shoe box I have had for a while. It is like rabbits, it just multiplies like mad. It is a mock log cabin. I the original pattern the background fabric was all the same. But in mine I made the background scrappy. Much more fun for me. I want to quilt feathers in the light spaces. Now for the big question..... What to border it with? I have been searching my closet for the right border. It has to come from the closet, as all the rest did. Anyway, I found this stripe I like, maybe. Here are two pictures, what do you think?? So you like this fabric? Should the stripe go up and down or sideways?? It needs and inter border, what color?? Lots of questions. Thanks for your ideas. While looking for boarder fabrics I worked on cleaning out my closet. Anything less than a half yard got cut up into Bonnie Hunter strips and some squares for a project. I only got the blues and reds done, so there maybe something else in there that will work also. 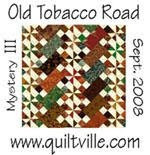 But the weekend is over and I have quilting for others to do. I dont have many 2 inch squares or strips, so this is a good start. 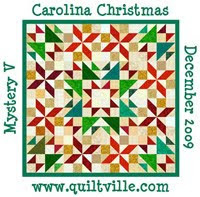 I need some for Bonnie's Christmas mystery and another quilt pattern on the table waiting for fabrics. thank goodness for spell check, You dont have to see my horrible spelling. good to see you posting. I like the diagonal stripe. I like the stripe going horizontally - in the first picture - like it is piano keys. GREAT BORDER. Do you have a dark fabric - navy blue or black for a small inner border before the striped red one? How about a 2 1/2" border of background fabric and then a 6 1/2" border of the stripe sideways? Great scrap quilt! I would definitely make an inner border of a strong, solid appearing color (red, blue) of about 2 inches (same width as the squares?) and then that stripe (6 inches) would be great sideways.